Last weekend, Brighton-SolFed organised different activities to commemorate May Day, the International Workers Day. Although the Working Class has not so much to celebrate these days, we used this opportunity for discussion, to give visibility to our struggles, and to invite our members and collaborators to have a good time together. On Saturday 30th April, we met in the Cowley Club. From 6pm, comrades from our ongoing campaigns (Hospitality, Health & Social Care, and SolFed on Campus) introduced our activity and our positions towards the situation in these sectors. After a brief discussion with the public, we then had dinner and a social. 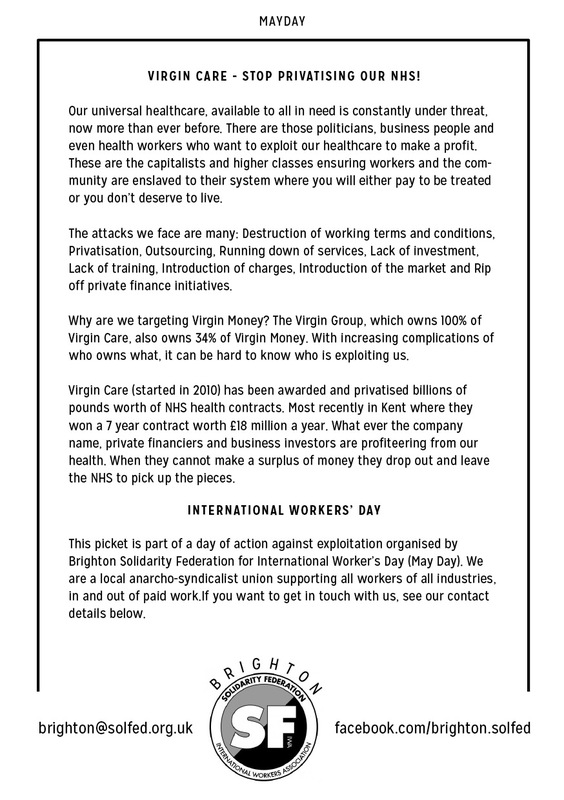 On Sunday 1st May, we had called out for a Day of Action Against Exploitation. At 3pm, around forty people met at the Clock Tower in Brighton's town centre. Then we started marching. The first stop was at the Synergy Centre. 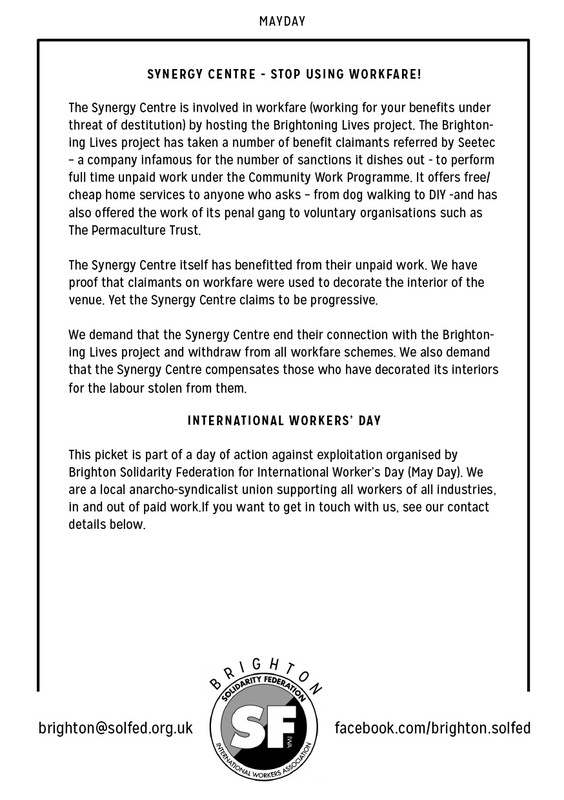 A comrade from Brighton Benefits Campaign took the microphone to denounce the use and promotion of Workfare that this “community centre” is involved in. 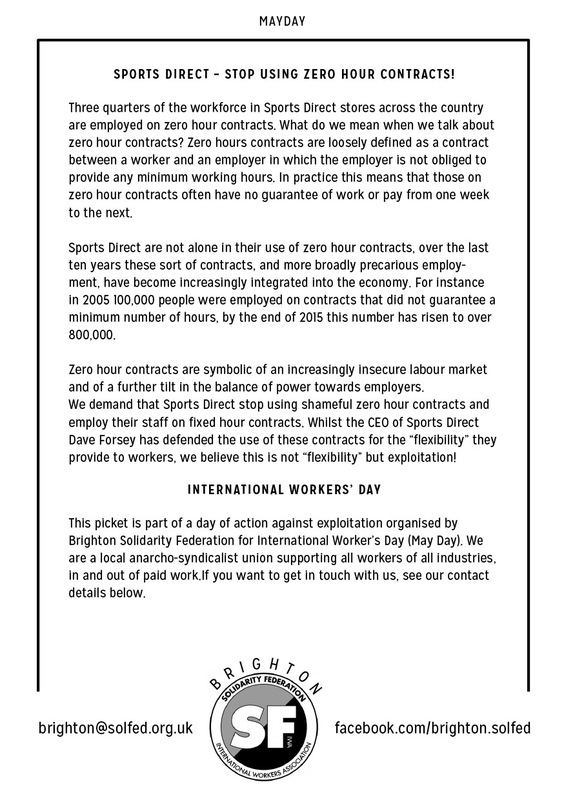 We then continued to the Sports Direct shop in North Street, where another comrade talked about zero-hours contracts, which are widely used by the company. Finally, we stopped outside Virgin Bank and a comrade - who works for the NHS - explained the involvement of companies like Virgin in the privatisation of the National Health Service. The activity finished at the Old Steine. There a comrade made a brief speech about May Day and the necessity of the struggle while our living conditions are being attacked. Then, a comrade from Brighton Antifascists invited everybody to join their next actions and asked for solidarity with the anti-fascists facing repression. Brighton-SolFed wants to thank everybody who joined the May Day activities. We are aware of our limitations and we know that we are much less than we would like to be. However, with our own resources, we are developing a proposal of action that is urgently needed in these times. This May Day, like every day, we were in the streets standing up for the workers struggle, which is the struggle for a free and equal society. Viva the International Workers Movement!